Welcome to the wonderfully, whimsical, vibrant and slightly mischievous art world of Marc Zuazua. Marc’s art is influenced by the everyday; however, artistically speaking, cues range from graffiti, cartoons and comics to works by contemporary masters such as Basquiat, Warhol, and Haring. This is pretty evident through his bold use of color and precise outlines. 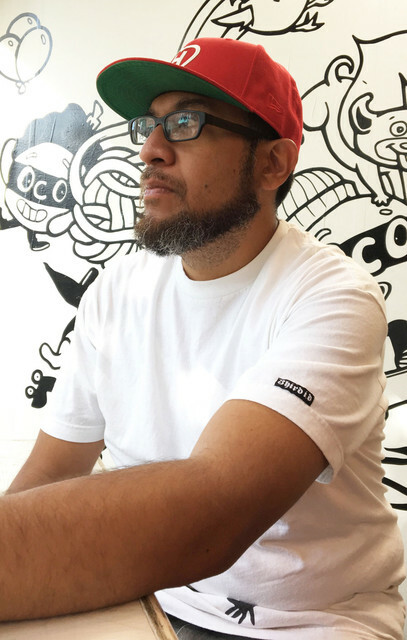 The artist holds a degree in communication design from Texas State University and made quite a name for himself through clothing design, custom painted sneakers and mural productions in bustling Austin, TX. In “The Music Capitol of The World”, Marc co-founded and curated the critically acclaimed art gallery, The 5th Gallery. The gallery was a hub of creative activity that helped unite and cultivate burgeoning artists, musicians and designers of Texas. In 2012, Marc uprooted from the party that is Austin and found a home in the art friendly Bay Area of California. In Oakland, he continues to create art, murals, and clothing that is geared to make people smile and think. You may also notice Marc's art on all walks of products and projects due to the work he does with the idea company he co-founded, Warning Kick Media. Warning Kick Media provides custom and unique design and marketing solutions for industries such as music and the visual arts.